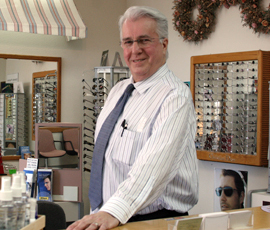 Dave Thayer is owner of Dave Thayer Optical in Hillsboro. He is a board member of the Oregon Native American Chamber of Commerce and active in the local Native American community. In his own words, he talks about his path to success and personal commitment to giving back to the community. I moved to McMinnville from Wisconsin in 1970. I’m a member of the Fondulac Band of Minnesota Chippewa. I knew that if I stayed in Wisconsin, I wouldn’t have done as well. My last name, although it’s English, is synonymous with being Native American. I wouldn’t have been able to start and grow a business. I was a barber for 10 years. I got into an automobile accident that hurt my shoulder. At that point, I knew that I had to get into something different. I had a customer who said they were looking for someone who’s good with the public, had mechanical ability and skills in math. About three months later, I was running an office in McMinnville. I stayed there for five years. After managing the office in McMinnville for a few years, I came to Hillsboro, to manage an office for a number of optometrists. Moving to Hillsboro, I found that people had a much-friendlier attitude. The reception I got from people here was much different. There was a growing Hispanic population at the time, and I knew many Natives. There was a solid age-old Japanese community that has been running businesses for several generations. In 1979, five years after moving to Hillsboro, I was ready to start my own business. I’ve been in business for more than 30 years. I enjoy being able to work with patients to give them the best service and product, and make a good living doing it. I’m most proud of being able to continue to compete, given all the changes that happen in business. I couldn’t start this business today, because of the changes in the competitive marketplace. There’s a lot of consolidation in this business nowadays. When I first started, insurance companies didn’t play a big role. Now, the insurance companies run this industry. Some insurance companies own their own retail chains. Where people get their prescription filled is dictated by what kind of insurance they have. I had to see the changes coming, but sometimes I had to get blindsided first. To survive as an independent optician, working closely with the doctors in the area is important. I’ve also partners with a doctor, who now works in our office. We used to order all our work from a wholesale lab. Now, we have to do some of our own work in-house to speed up the process. The product line also has changed tremendously. Clyde Stryker, a founder of the Oregon Native American Chamber, had been a patient of mine for a long time. I contacted President Janie Millican about becoming involved, because I wanted to have the opportunity to share my experience with other Native business owners. I don’t benefit financially from being part of the organization, but it does me good to be able to talk to people and try to help them out. It’s good to have a business community made up of Native Americans. When I talk to people who are thinking of getting into business, my goal is to give people confidence that it can be done, especially if you’ve got a good, viable idea. It’s rewarding to see people from the Native community succeed. We have people that are very good at what they do, and they’re expanding their businesses across the country. As Native people, it’s important that we look at the past – what we had and what was taken from us – in an effort to retain what we have. Many Native people don’t realize what the general public thinks of us. There are many stereotypes that are associated with Indians that causes people to exclude us from a lot of things. There was a high-profile construction project that involved building a Native American center. It was assumed that Native businesses would get contracts to work on the project, but in reality, Native businesses got very little of the business. In the end, some Native businesses were offered to do landscaping work. It was distressing to learn what they really thought of us. We have high-skilled people, but they didn’t think of Native businesses as being capable of large-scale work. I’m light-skinned, and I get to hear a lot of things about Indians and other minority groups. I challenge people, in a nice way, when I hear such remarks. The general public does not associate Native people with mainstream business, even though we are as good or better than a lot of our counterparts who are doing the same thing. We don’t have the good ol’ boy network. I think a lot of people of color have the same problem. It’s a tough world out there. My involvement in the Native community is so precious. I help where I can, and it’s good to be able to see people succeed. I hope that for the coming generation, they can learn from the example of Native business leaders, and see that we have made it. That it is possible to succeed and run a profitable business. Many tribes around the country are working hard to inspire young people to branch out on their own. Although I was born on the Rez, I never lived on the Rez. Still, my family has influenced me a lot. Many of my relatives worked for themselves. We’re capable, hard-working people. The officers of the chamber are all businesspeople who take time out of their businesses to work with up-and-coming Native businesses. It’s important to take time out for community activities, and only wish I could do more. "When I talk to people who are thinking of getting into business, my goal is to give people confidence that it can be done, especially if you’ve got a good, viable idea. It’s rewarding to see people from the Native community succeed. We have people that are very good at what they do, and they’re expanding their businesses across the country." "The general public does not associate Native people with mainstream business, even though we are as good or better than a lot of our counterparts who are doing the same thing. We don’t have the good ol’ boy network. I think a lot of people of color have the same problem. It’s a tough world out there." "My involvement in the Native community is so precious. I help where I can, and it’s good to be able to see people succeed."